Standards are critical for identification systems to be robust, interoperable and sustainable. 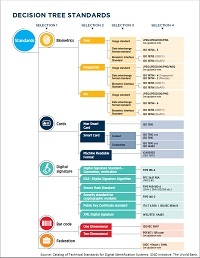 This report identifies the existing international technical standards and frameworks applicable across the identity lifecycle for technical interoperability. 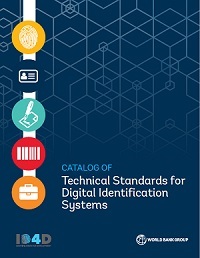 This catalog of technical standards serves as a reference for stakeholders involved with digital identification systems. The catalog includes a decision tree to help identify areas where standards are available, and areas where there are competing standards, which require a choice to be made. Guidance notes on competing standards are provided to aid in the selection process. Technical standards for robustness of identification systems, such as security and quality, are also included in the catalog. A decision tree of the technical standards organized by technology area is provided to help with the selection of technical standards from the catalog. The application of the decision tree, in selection of standards for identification systems, has been illustrated in the country case studies of Estonia, India, Malawi, Pakistan and Peru. These country case studies are intended to help share experiences across countries and avoid reinvention of the wheel by each country/stakeholder.